This Antlered Meeble Walker monster amigurumi measures about 4 inches tall when finished and includes a full unique video tutorial to help you get through the tough parts! This pattern requires a few color changes. Be sure to check the note at the end of each Rnd before you make the round to know when to change colors. Carry colors required for each round along with you before you need to do a color change. This entry was posted in Amigurumi, Blog, Crochet, How to Crochet, Monster, Pattern, Patterns on March 27, 2018 by louibob118. Watch live starting at 5pm PST right here!! 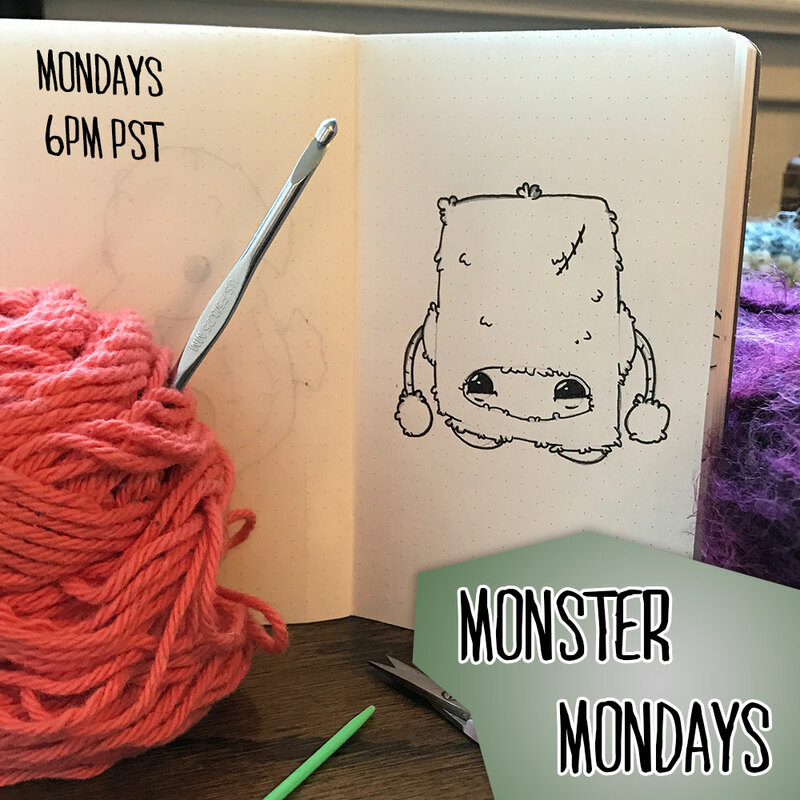 Welcome to Monster Mondays, where I crochet a completely original creation! Join the chat where you get to talk with me, choose a name and vote on next weeks monster! New live stream every Monday and Thursday! Subscribe and push notifications to get notified when I go live! This entry was posted in Blog, Live, Monster on February 27, 2017 by louibob118. This is Little Guacamole from last weeks Monster Monday livestream collaboration with Mary Doodles! Oh and here’s the time lapse video of me making it! I’ll be live again tonight at 5pm PST making a fans drawing! This entry was posted in Amigurumi, Blog, Crochet, Live, Monster, video, Youtube and tagged creature, creatures, crochet, live, livestream, louiesloops, louiesloopslive, timelapse, video games on February 27, 2017 by louibob118. Every week I crochet a new original character based on a sketch! Here’s this weeks! Bummer. You missed the live stream. But you can watch the archived version on my Patreon right here! This entry was posted in Amigurumi, Blog, Crochet, How to, How to Crochet, Live, Monster, video, Youtube and tagged creature, creatures, crochet, live, livestream, louiesloops, louiesloopslive, monster on February 13, 2017 by louibob118. This is Rocky the Frankenfluff, hes always getting in fights but his little legs makes it a bit tough to win. His favorite move is the flail. This entry was posted in Amigurumi, Blog, Crochet, For Sale, How to, How to Crochet, Monster, Pattern, Patterns and tagged creature, live, livestream, monster on January 25, 2017 by louibob118. Bummer you missed it, but I’m live every Monday and Thursday at 5pm now! So I’ll see you then! Aww, you missed it! But don’t worry! I’m live every week on Monday’s and Thursdays at 5pm PST! Subscribe on YouTube here, or follow on Twitch here to make sure you don’t miss it next time! And you can still watch a rerun of it all by becoming a Patreon supporter here! This entry was posted in Amigurumi, Blog, Crochet, Live, Monster, video, Youtube and tagged creature, creatures, crochet, live, livestream, louiesloopslive, monster on January 23, 2017 by louibob118. Watch me make it live tonight (1/16/17) live right here! This entry was posted in Amigurumi, Crochet, How to Crochet, Live, Monster, video, Youtube and tagged creature, creatures, crochet, live, livestream, louiesloops, louiesloopslive on January 16, 2017 by louibob118. Welcome to Monster Mondays, where I make a completely 100% original crocheted creature! 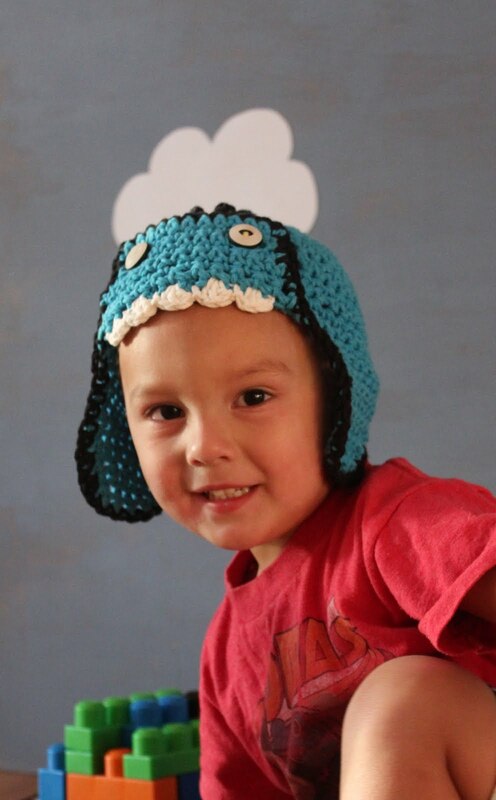 This entry was posted in Amigurumi, Blog, Crochet, How to, Live, Monster, Uncategorized, video, Youtube and tagged blog, creature, crochet, live, livestream, louiesloops, louiesloopslive, monster on January 9, 2017 by louibob118. People joked, called it a conspiracy, well I’m here to tell you it’s real. Yes, the great elusive Sasquatch has been found! Okay, maybe not that, but still good news! A new item in the shop today!! Originally I was going for Chewbacca, but he’s got a certain persona that’s hard to grasp. So check out the Bigfoot / Sasquatch / Chewbacca Earflap Hat in the Etsy store today! These hats were made using my Aviator Earflap hat pattern, which is also available for purchase in the Etsy shop as well as Ravelry and Craftsy. This entry was posted in Bigfoot, Blog, Chewbacca, Ear Flap, Earflap, Etsy, Hat, Monster, Sasquatch, Starwars on June 18, 2012 by Louis Mensinger. They’re available in dino green, monster turquoise/grey, and dragon blue. Custom colors and orders are also available. You can get more information on the dino green here and the dragon blue here. 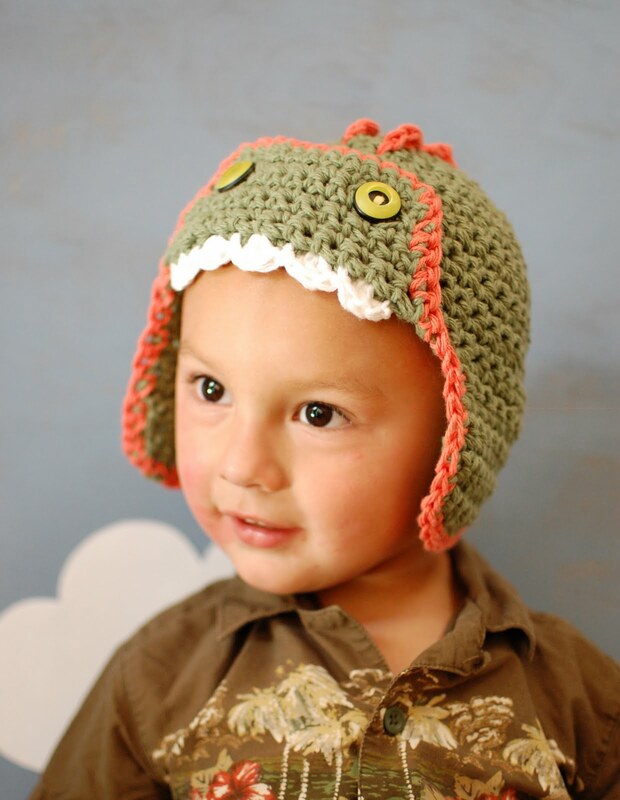 This entry was posted in Baby, Blog, Boy, Child, Dino, Dinosaur, Etsy, Hat, Monster on September 18, 2011 by Louis Mensinger.